Welcome to Eugenes leading Holiday Inn Express Hotel & Suites! We are just steps away from the University of Oregon, Autzen Stadium, and the historic Hayward Field. Stay with us and cheer on your Ducks for any sporting event! 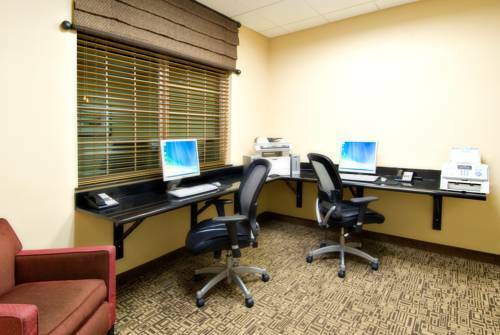 Families enjoy our spacious suites and complimentary hot breakfast while business travelers take advantage of local business only a few short blocks away and complimentary wireless and hard lined Internet options throughout the entire hotel. Everyone can appreciate our helpful and knowledgeable staff that can get you where you need to go or help you relax. You have endless shopping and dinning options as we are in the heart of Eugene, with the brand new Boulevard Grill next door and many other downtown dinning options to choose from. Eugene is known as the Worlds Greatest City of Arts & Outdoors and when you stay with us you have access to the best with Alton Baker Parks renowned running and biking paths located just behind the hotel. The Holiday Inn Express Hotel & Suites in Eugene is proud to be Oregons School Activity Associations headquarter hotel!